The rise in apartment prices in Israel over the years has caused many a sleepless night for many people. On the one hand many young couples are unable to purchase apartments due to the high prices. On the other hand many people are able to buy apartments as an investment. In the past few years the government has made dramatic changes in land taxes (capital gains tax and purchase tax) in the hope of bringing down the prices of apartments. The exemption from capital gains tax was almost eliminated completely in an effort to get people who own more than one apartment to sell their apartments thereby flooding the market with apartments. Purchase tax for people purchasing their only apartment was lowered. Purchase tax for investors in additional apartments was raised. These maneuvers by the government did not work, as prices continued to rise. Now, as a new government gets settled in, with a new Minister of Finance there are plans to raise purchase tax on apartments bought for investment purposes to a whopping 20%. This will cause a sharp increase in purchases of apartments by investors until the new law is enacted and a sharp decrease in apartment purchases thereafter. In is unknown what affect this will have on the real estate market and on the Israeli economy. People with money to invest will look for other avenues. Will apartments in the U.S. or Germany look more attractive now? Will this cause the transport of Israeli money out of Israel and prevent the investment by foreigners in Israeli real estate? Will this cause a decrease in apartments for rent? In a recent interview in Globes the well known Israeli builder, Yossi Avrahami states that another rise in real estate taxes will cause many construction companies to stop purchasing land for building because there will be less purchasers. Many professionals that work in the construction business will lose work and many will go bankrupt. 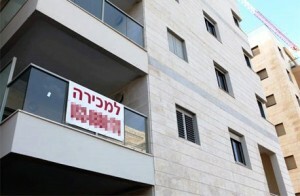 Avrahami feels that if the government would lower taxes on the building industry the prices of apartments would go down. In his opinion 50% – 60% of the prices of apartments are taxes, such as purchase tax, V.A.T. on the building services, income tax on workers salaries, taxes on materials etc. If those taxes were lowered the prices of apartments would go down.